The Moluccan cockatoo (Cacatua moluccensis) is one of the most well-known cockatoo species there is. They grow very big and have an impressive look. The feathers of this species are white with a pink glow, the feathers under the wings are yellow and the feathers of the crest are bright orange. When the crest is down you cannot see this orange, but when he erects his crest it is very bright and beautiful. The bill and feet are black in color. This species also goes by the name Salmon-Crested Cockatoo. The Moluccan cockatoo occurs in Eastern Indonesia on the island Seram and possibly the small islands around. They live in small groups in the tropical or sub-tropical forest. The Salmon-Crested cockatoo species is endangered because of habitat destruction. 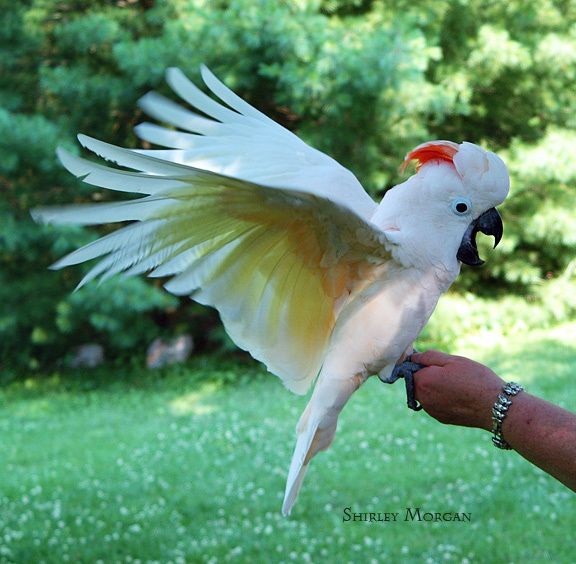 Moluccan cockatoos are very popular in bird shows, in zoos and as pets because of their impressive size, beauty and intelligence. They are eager to learn new tricks and will master them quickly. They can also become very tame and affectionate to their human owners. Unfortunately, this species can also revert to self-mutilation, excessive screaming, feather plucking and aggression towards people. People think to buy a beautiful big bird, but instead get a bird that pulls out its own feathers, screams all day and it aggressive to it’s human caregivers. The Moluccan cockatoo is seen as one of the hardest species of bird to keep as a pet. It really needs a lot of attention to keep him busy and happy, a big cage or aviary and correct training. Even when a Moluccan cockatoo is kept in a way that keeps it happy and healthy, it is still very noisy (screaming every day) as part of it’s natural behavior. Like all species of cockatoo, the M2 likes to chew on things and destroy wood, furniture and all other objects it can find.